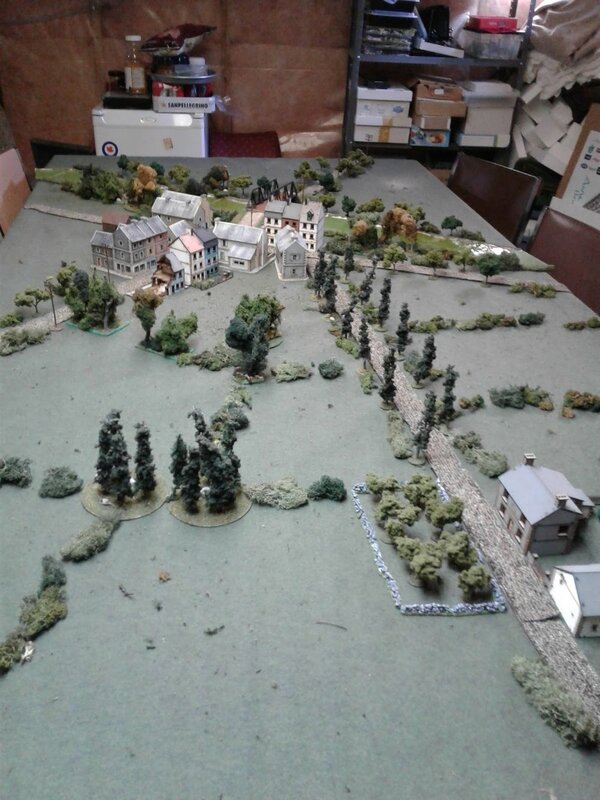 Inspired by reading the Cinderella Campaign and the dash across France in Sept 1944 plus the table I set up Friday to try out my new buildings, I thought that a Breakthrough scenario would be spiffing good fun. I also haven't had a lot of Shermans out in years. Playing solo I could take my time, enjoy a glass of port and not worry about comments about play balance. So two platoons of Grenadiers with a platoon of three PaK 40s and a platoon of three StuGs are holding the town as a rear guard. For the German company HQ I opted for two MG42 teams. Each platoon also had two panzerfausts. The attackers get a company HQ plus five platoons. So I took an armoured squadron HQ, three troops of tanks and two platoons of infantry mounted in carriers and trucks. Both sides also rolled well for air support, which gave my FW 190 and Spitfire a chance to see some table action for the first time since I bought them ten or twelve years ago! The Canadians deployed into two elements: Squadron HQ, 1 Troop and a platoon of infantry in 15 cwt trucks advanced up the road past the farm. The other two troops and a platoon of infantry in carriers advanced through the fields on the left. 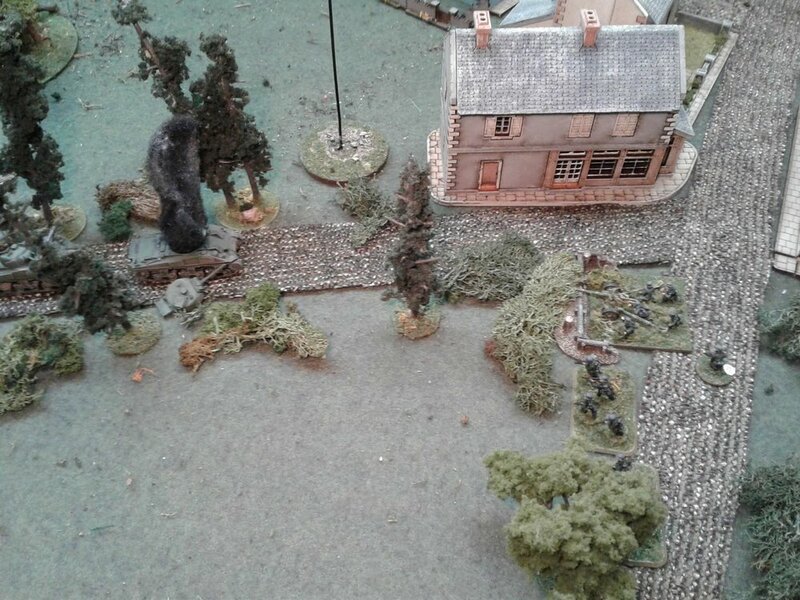 The Germans put some infantry in the hedges and trees in front of the town. An MG42 was positioned in a building to cover each flank of the town. One PaK40 was in the trees covering the Canadian left, but the second was back closer to the town to shoot down the road and the third was dug in near the bridge. The StuGs were held in reserve. In hindsight I should have deployed the infantry in the houses and put the StuGs forward to engage the allied armour right away. The Canadian plan was to use a rapid advance to get to the bridge before the twelfth turn of the "blank/special" card, which designated the end of the game (or in my version the pioneers blow the bridge) and try not to get bogged down in firefights. The scenario specified "Armoured Bonus Move" card really helped with that, especially in the early turns. Opening moves. Squadron HQ spots German infantry lining the hedge and deploy into the field, hosing the poor landsers with HE and .30 cal. fire. 1 Troop roars past along the road spraying the German flank. A FW 190 strafes the road, stopping the allied advance. More air power overhead. 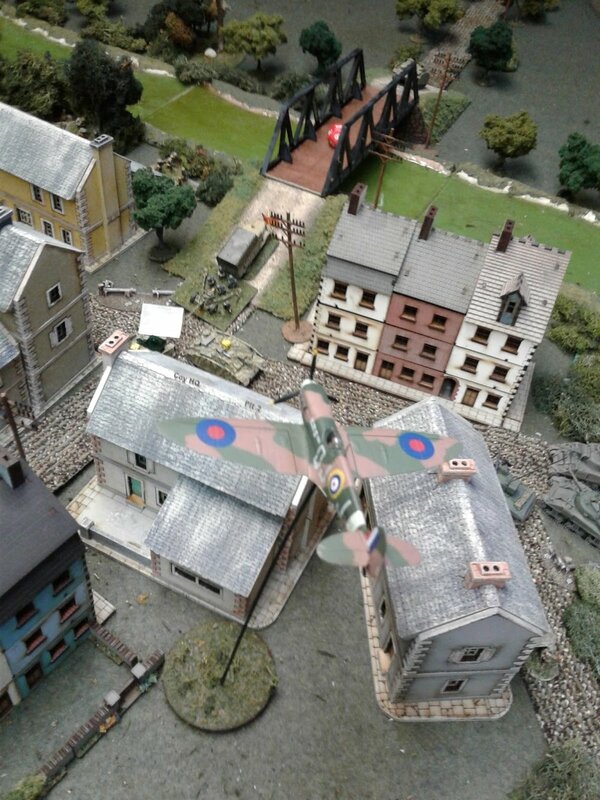 A Spitfire buzzes the Germans. A PaK 40 reveals itself, brewing up the lead Sherman. The PaK 40 in the woods in front of the town also opens fire, getting a few ineffective hits. Using an "Armoured Bonus Move" card a troop of Shermans rush forward. Infantry in their carriers swing to the left. But the PaK 40 card comes up first and brews up the troop leader. Meanwhile, demonstrating how fire and maneuver works. A section from the right platoon clears the first line of trenches taking six POWs . 1 Troop roars forward with another "Armoured Bonus Move" card, overrunning the second trench line. 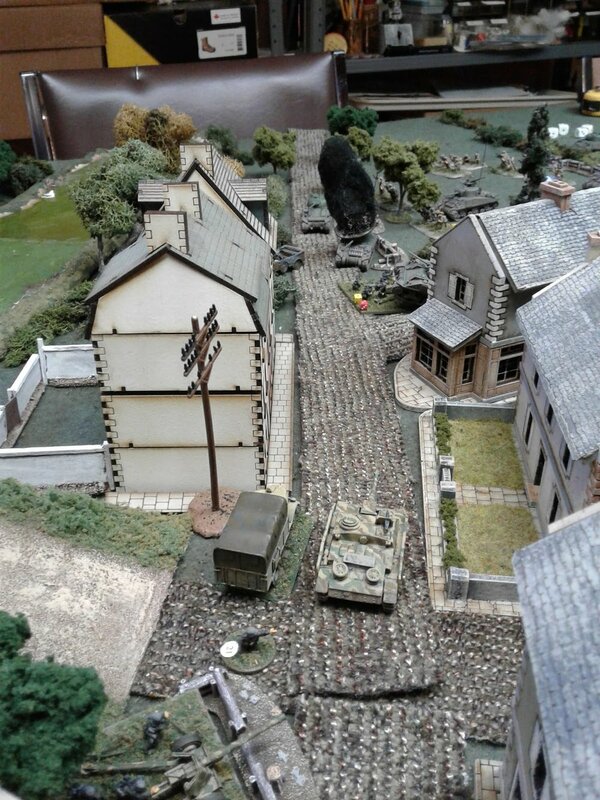 The Germans hunkered down and tried assaulting the tanks without effect. Once the Canadian infantry came up, the combination was able to eliminate the trench line. 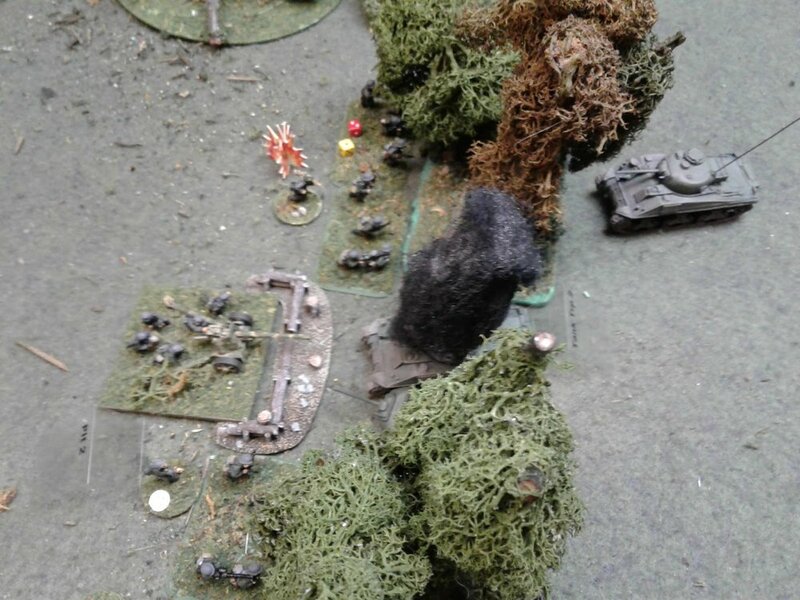 The troop leader is positioned just short of crushing the dug in PaK 40. But he got stunned by a shot from a StuG in the town and delayed crushing the gun. But I didn't let the gun fire, having a tank on the edge of the gun pit and all. Middle troop of Shermans breaks into the German position, flanking the right hand platoon. Fire from both troops shattered the Germans and destroyed the Pak 40. Canadians deploy from their carriers on the flank of the town, end running the German defense. Shermans then overrun the shocked Germans at the tree line avenging their dead troop leader. Only three Grenadiers make it back to town. Flanking platoon sends out its PIAT team to hunt StuGs. 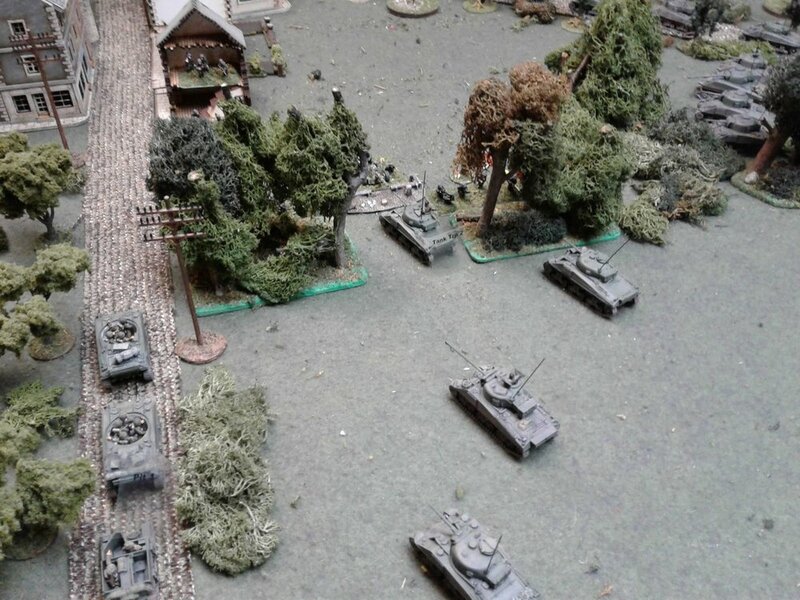 On the Canadian right, there is a traffic jam, with a mass of tanks and one narrow road, down which high velocity 75mm AP shells are screaming. The StuGs deployed at the crossroads, firing down each street at advancing Canadian armour. Canadian and German armour spend a few turns banging away at each other. With the German position crumbling, I decided they should try and save what they could. One StuG followed by a truck towing the last PaK 40 try escaping over the bridge. A Spitfire swoops low, 20mm cannon chattering, pinning the truck in place. The left hand Canadian platoon dash to the river and engage Germans on the bridge, knocking out the truck with rifle fire. Gun crew dismount as a half section of infantry. The surviving German infantry had retreated to the central house and spent a few turns having their shock rallied off by the surviving German Big Men. The tank duel was going badly. 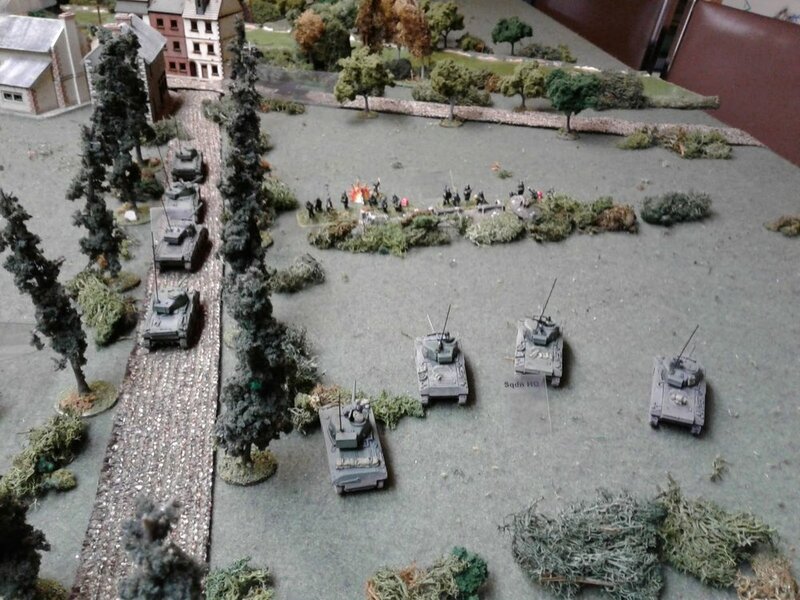 Shermans are at both ends of the street and getting a mobility kill on the StuG in the picture, causing the crew to bail out. The Canadian Squadron commander and one of his troop tanks advance up the street. The surviving Germans fired off their remaining panzerfausts, causing minor damage and then ran for the bridge. The last StuG was heavily damaged in a shoot out with a Firefly and tried retreating to the bridge but got brewed up trying to squeeze by the disabled truck and PaK 40. A German MG42 team had relocated to the green house, firing on the Canadians near the bridge. Seeing this two Shermans poured fire into the lower floor setting the house on fire. Here you can see the end as Shermans roll up each street, squeezing past the knocked out StuG to round up the fleeing Germans. The Squadron commander advanced his tank to the bridge, machine gunning the fleeing Germans. Those who survived surrendered. The Germans were utterly destroyed (except for one damaged StuG) and the Canadians still had five turns of the special card to secure the bridge. The Canadians lost eleven KIA plus three tanks brewed up (so 26 total dead) and took thirteen POWs including two Big Men. Playing solo I could also play this out to it's bitter end, pausing Saturday night for bed and then resuming action on Sunday. I also "live Tweeted " this game which was an interesting way to record events as they unfolded, taking and tweeting an awful lot of pictures with commentary. But it would be annoying if I hadn't been playing solo. I did garner some "retweets " and likes from strangers, which is all very odd. But Twitter is rather ephemeral and strange.